this is my all time favorite cake – please try it! This cake has been on my want-to-make list for such a loooong time. This cake is one of my weaknesses. If I let myself, I could probably eat the WHOLE thing. No kidding. Last day on earth? Yes, I’ll take a piece of this cake as part of my last meal. Heck, maybe even make it the entire meal! Growing up, Italian Rum cake was a must-have for every birthday celebration. We didn’t do chocolate cake, sheet cake, or any other cake. My family and most other Italian families in the neighborhood had this kind of cake to celebrate birthdays. Italian rum cake will always remind me of my old neighborhood in Philly; my mother; my Italian roots; my childhood….bittersweet memories for sure. I’m so glad that I’ve found a way to make it just as I like it because it seems to be harder and harder to find a good Italian rum cake. what is Italian rum cake? The cake is made with three layers of sponge cake (think Angel Food cake but with the egg yolks) that are soaked with a rum-flavored syrup, filled with layers of vanilla and chocolate pastry cream, iced with a bakery style frosting, [update: I am now using a stabilized whipped cream frosting] and adorned with crushed peanuts (or sliced almonds) on the outside (peanuts should be crushed a tad bit more than shown in photo). it’s not as hard as it looks to make! Don’t be intimidated by the instructions – the key is to make the cake in small steps over time, and then assemble it the day before or morning of the celebration. I made the sponge cake and froze it a week ahead, and also made the frosting a few days prior. I made the pastry cream the night before assembling the cake and the rum syrup the morning of assembly. 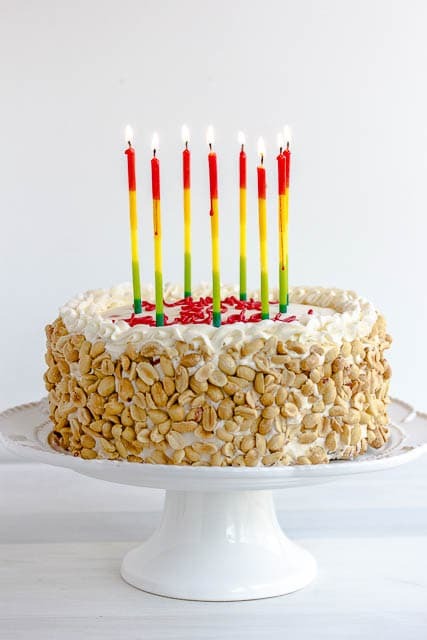 I’ve seen a few versions of this cake online but with almonds instead of the peanuts. In Philadelphia, most if not all of the rum cakes that I’ve seen have the peanuts – I do wonder what area uses the almonds? It’s easy enough to substitute, but here in Philly, we’ve gotta have the peanuts. 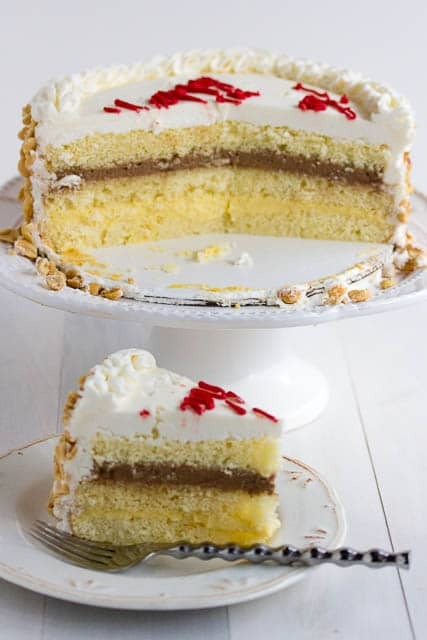 Makes an 8-inch, three layer vanilla sponge cake sprinkled with rum syrup then filled with vanilla and chocolate pastry cream, topped with bakery-style buttercream and decorated with crushed peanuts - does it get any better?!? 6 large eggs , separated; separate when cold. Can use cold in the recipe. In a medium saucepan, add milk, sugar, salt, and vanilla or chocolate; heat until small bubbles form (scalded) and remove from heat. Temper eggs by adding small amounts (about 4 ounces) of the hot milk mixture at a time, while whisking very QUICKLY to prevent the eggs from curdling. After all of the milk mixture has been incorporated into the eggs/cornstarch, return everything to the saucepan and cook over medium heat and stir constantly until thickened. My mother does this over a water bath because it quickly thickens and can very easily burn; I didn't use a water bath. Whip heavy cream only until soft peaks form (overbeating will cause it to turn to butter) and fold together with cooled pastry cream (rewhip this if it has been refrigerated). Combine all ingredients in a saucepan and heat over medium-high heat until sugar dissolves and then cool or store in refrigerator. Combine flour with salt in a small bowl and set aside. Sift the flour onto the egg yolks in two additions, and stir gently with large spatula to combine. UPDATE: I used three 8 inch pans and split the batter equally among the pans and it worked just as well with no waste; that is, no need to split the layers if you use 3 pans. 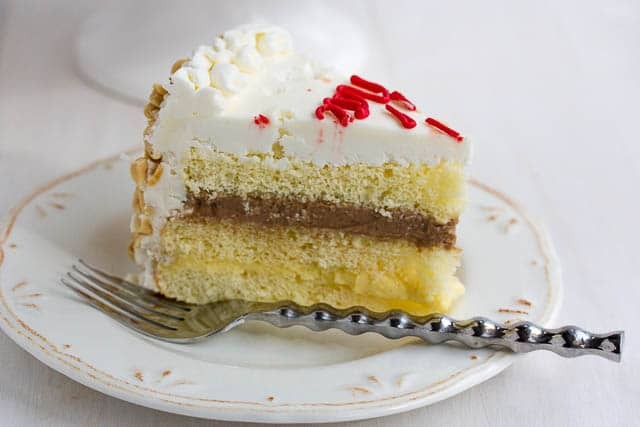 Remove frosting from the refrigerator and allow to come to room temperature to facilitate spreading. 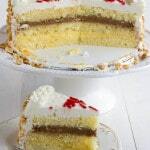 Using a teaspoon, spoon the rum syrup evenly over each of the three cake layers. Spread all of the vanilla pastry cream on top on the bottom layer and then top with another layer of sponge cake. Frost cake, and add generous amount of crushed peanuts to the sides of the cake. Decorate the top if desired and refrigerate until serving. If you are baking in 1 or 2 pans, freezing the cake makes it much easier to cut into layers. I'm now using 3 eight inch pans so I no longer split it. Ensure frosting is at room temperature and fully softened before trying to frost cake. UPDATE: I am now using a stabilized whipped cream frostingthat use instead of the bakery frosting listed here. Also, a reader recently commented about the use of cream cheese frosting for a more authentic cake. Although my Italian-born mother always used cream cheese frosting in her cake, the Italian bakeries in the Philadelphia area did not - feel free to customize the frosting to your taste. I just finished making this for my dad’s birthday. My husband-to-be is from South Philly, and he and my dad both LOVE Italian rum cake. We usually buy it from a local bakery but this year, I thought I’d try my hand at making it. Haven’t tasted it yet, but it looks beautiful!! I grew up in South Philadelphia and never saw this made with peanuts. However, you could have it made with “jimmies” (black sprinkles) instead of sliced almonds, which is the way we always ate it. I was raised by my grandmother back in the 50s in east Hollywood Los Angeles California both my parents worked and lived in the San Fernando valley so they thought I’d be more stable at my grandmothers house we were very near the Los Feleze area there was an Italian bakery there on Los feleze called Sarnos bakery their pastrys we’re superb! Like you their Rum cake was to die for! And was the cake of choice for every one of my birthdays! Made much like yours except for the nuts they used Almonds chopped and sliced they went out of business back in the early 70s 2nd generation ran it out of business. I will try your recipe changing only the nuts oh, I forgot to mention they had pine nuts scattered here and there! I would have to change it to sugar free if possible as I am diabetic! I look forward to it as I have not had this Rum cake in close to 50 years. In New York it is the almonds. My husband’s family is from northeast Philly and the rum cake they used to buy had sliced almonds, I’ll be making this for my mother-in-law this Christmas as she hasn’t had a descent rum cake since we moved to Florida. Thanks for the recipe. Hi Marie. I’m from South Philly too. I remember Italian Rum Cake as “the Birthday cake.” Had to have it and you are on point with the icing and the peanuts being crushed smaller (more like those used as topping at the ice cream parlor. ?? I’m from south of Boston area …..lots of Italians…the rum cake above. … was a traditional wedding cake in that area. I don’t recall the peanuts at all, but the frosting was more of a whipped cream frosting……delish!